Ambrosia Fruit Salad done light! Ambrosia fruit salad is a simple fruit salad you can make. This recipe comes from my Learn to Cook series. You can quickly put together this ambrosia fruit salad in no time. Often Ambrosia Fruit Salad is laden with calories, this light version is quick and easy to make, and has so many less calories, and would be perfect for you to prepare for your friends and family. This recipe is from my Learn to Cook series, where I cook all of the recipes from my old cookbook from junior high school. I am working on a project of working my way through this cookbook, writing the recipes, and shooting a video for each one of the recipes in this book. I hope you enjoy these recipes. 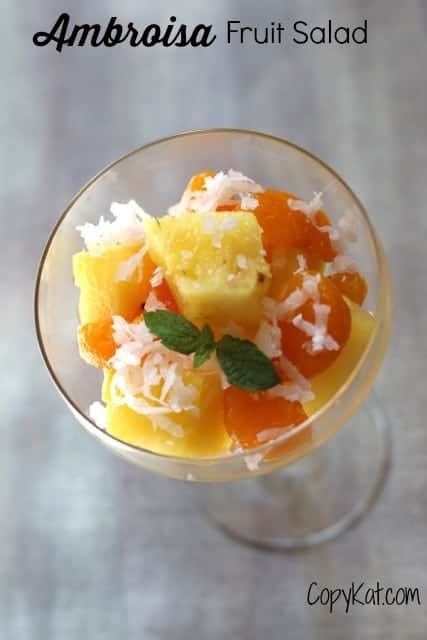 This fruit salad contains pineapple, you can use fresh or canned, orange segments, and flaked coconut. This salad is very easy to make. I like to use small oranges for this recipe. When I can find them I really like to use the halo oranges. If you can’t find these, I know you can use fresh mandarine oranges, clementines, or in a pinch I have made this salad with canned mandarine oranges. For this I use the sweetened coconut in the baking section of most grocery stores. This fruit salad is easy to make, and you can make this ahead of time. In fact this stores well in the grocery store for about 4 or 5 days in the refrigerator. I love to cook up several things on the weekend so when I come home from work I can quickly get dinner on the table. This light and refreshing Ambrosia Fruit Salad is so easy to make. Mix the orange sections and pineapple in a small bowl. Sprinkle coconut over the orange sections and pineapple. This was so easy to make for my family dinner!